We took all of the photos of our latest TDI engine conversion project and made them into a quick little video. Making Ken's Toyota Sienna road ready to head to the mountains with a new fuel pump assembly and resistor. We love helping families get there, where ever their, there maybe! It is always a good day when a 200 TDI conversion is completed with upgraded D90 steering to boot. See Rick's quick clip here. "Hi everyone, I recently moved back down South and would like to know of a good Rover shop in the area if anyone is familiar with any or has had any good experiences anywhere. Best I can find is a classic British car shop and remnants of something called "Lowcountry Overland" where the phone is never answered and messages are not replied to. I'm not looking for a restoration shop (read: not looking to drive more than 45 min away from Charleston) just a regular place that gets Rovers. I used to take my D1 to J White's Automotive in Framingham, MA when I lived in MA and was thoroughly spoiled by having an excellent Rover shop so close by. Any suggestions would be appreciated!" 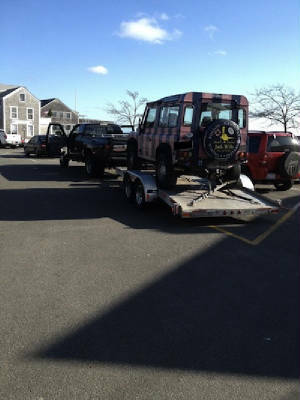 Rescuing our cape and island Land Rover, vintage and specialty customers is always an adventure and a pleasure. We are loving the contrast of old and new Toyota 4x4's at our shop today. What a great day! We are proud to be a small part of getting you there.